Sarah, from A Beach Cottage. So I thought I would share with you how I tried to give my house a feeling of living by the sea.. I have a small collection of shells, so I sprinkled some shells down the center of my table. My husband's friend let me have access to his property so I could cut some pretty flowering branches. I set out a few of my sea shell candles. 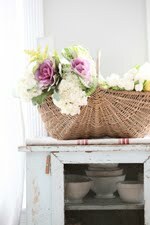 I used inexpensive white cloth napkins that I had found at Marshalls. I have a few vintage napkins that have a touch of pink fabric, so I added those to the table too. I added a mix of sea colored bottles to my french bottle carrier. These little clay tags with the french script came from the sweet Ness, from Marley and Lockyer. The clock and door have since found another spot to reside in the house. I really appreciate all of your support! I can't wait for spring! These pictures are gorgeous! Beauitful. So fresh and soothing to look at! Have a great week. This post is just lovely!! post of the day for me! xxxthanks for sharing! Gorgeous pictures...You made a great job! Thank you for a lovely revisit to your gorgeous home in Springtime! Your home is sooo beautiful - I am so mezmerized by the gorgeous natural light through your windows showcasing your style. :) Love the flowering branches - such a pretty color. I can't wait for Spring! Gorgeous, and very feminine. Roll on Spring! OH these pictures !!!! Just stunning, Yet another day of snow here. 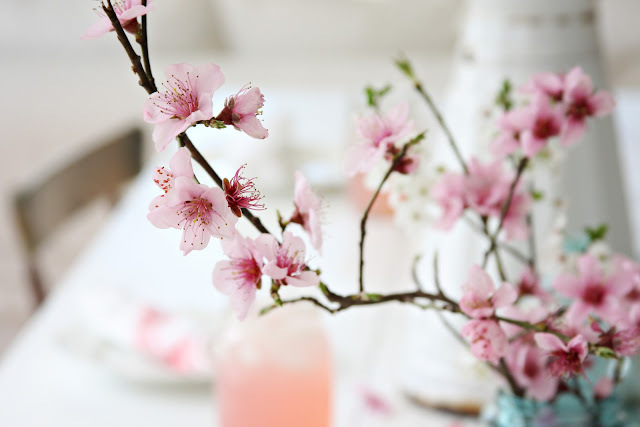 I keep telling myself just 55 more days until SPRING, and I'm counting down soon my cherry tree and lilacs will be in bloom.thanks for sharing. It is pretty Maria. I know what you mean when you see an old image and how it was decorated...we are always switching things around here too! i love your house, i want to live in your blog. just beautiful!!! So pretty, I can actually smell the spring air while looking at the photos. Just beautiful, Maria! All of of the details are perfect! Hope your shop is doing well! You're welcome, and I love your 'blown out' pictures! Simply beautiful! But I'm left wondering what type of beverage was in your jar glasses?? I just wonder if your personality is like your photos? 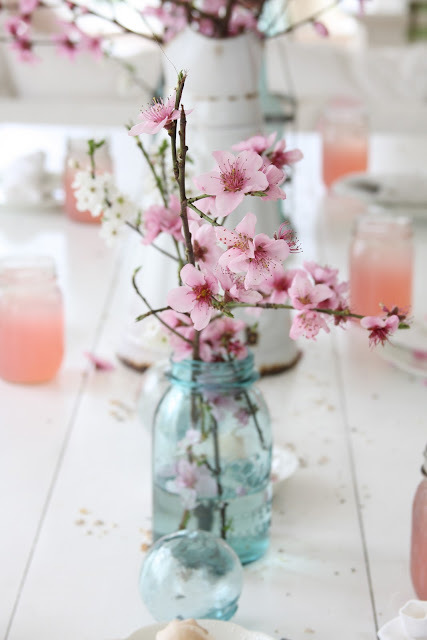 They are alwyas so light and refreshing and always have a touch of whimsy! love it! I love these photos. 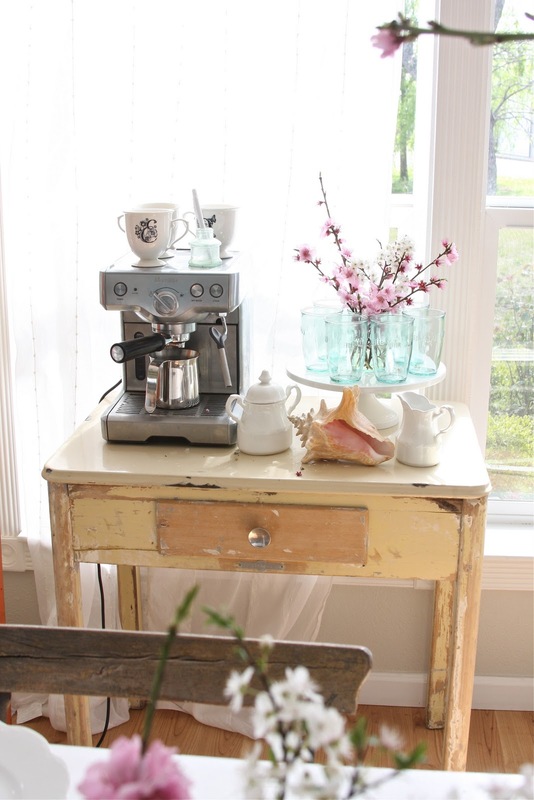 I saw them the first time around at Beach Cottage and simply fell in love with your house! Please tell me what is in the little jars? It looks like some delicious drink. The pink colour is divine with the seaside feel. Hi Maria - Just like you, I can't wait for spring to get here either! But my goodness, what are those yummy looking branches? What kind of tree are they from? Is it "cherry apple"? I'm so curious coz they are just so beautiful, aren't they? You're so lucky to be able to cut them from your friend's property. I can't wait for Spring to get here either. Your pictures are absolutely gorgeous, Maria! I love your table setting... beautiful!! 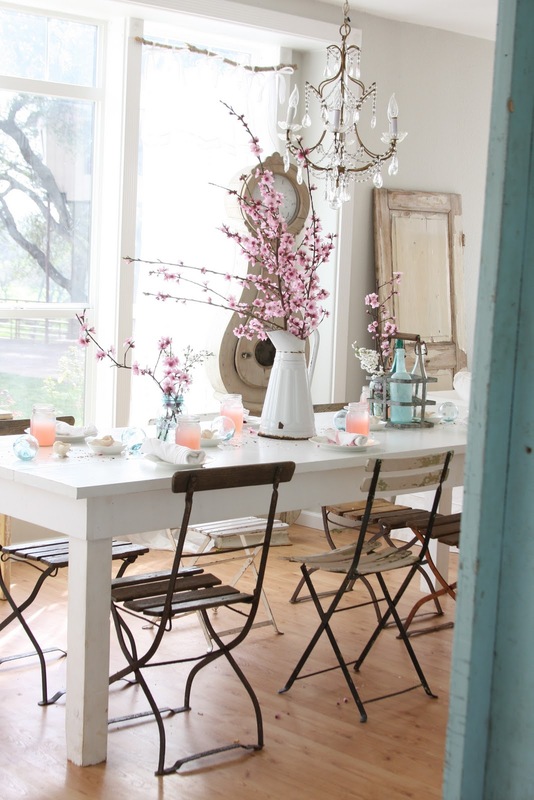 I always have a group of friends over in the spring just so I can use my spring dishes! absolutely beautiful...love all the sea glass color! your home is magnificent...on my way to check out your online shop now! I love spring! Thank you for the beautiful pictures! 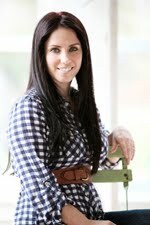 Hi Maria, just found your blog today, where have I been? Love it, love your style and your photos are amazing! I just love looking at your photography! Can't wait for spring and my white lilac tree blooming here. Love the floats, have a collection here, they're perfect... hey, I love your taste. Great minds think alike. These are such beautiful colors...the little "pop" of peach is just perfect. Thanks for sharing this visual feast with all of us. You make this ohio girl very jealous of the California sunshine! Oh my gosh, I just love the blossoms and the very soft blue touch in this room, so gorgeous. just beautiful and really inspiring. in february i am so painting my living room armoire already! Lovely! Just perfect! It`s raining in western Norway, and I don`t mind, I need spring! :) But we have to wait many months... This gave a lift to my dreams! Thank U! Hi! 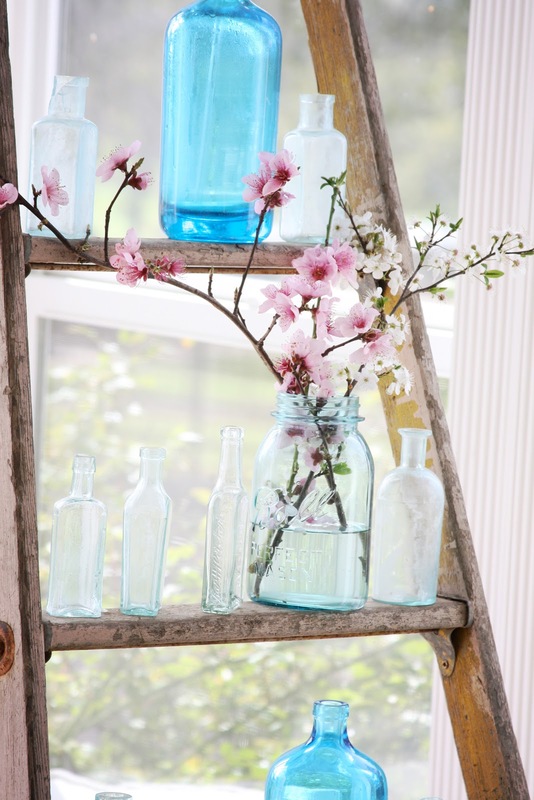 I am your newest follower, and WOW do I LOVE your style, I ADORE everything in these pictures-you have the looking going on that I aspire to have some day...for now I will keep collecting blue ball jars, old doors and white frames and dream of your beautiful rooms! With the heat we have had this summer here down under I am hanging out for Autumn. Just beautiful Maria! I always wait anxiously for your posts! I am so inspired by your gorgeous home...hope you show us all the changes you've made! Hints of spring is just what is needed here in the very, very cold Northeast! Thanks Maria! Thanks Maria needed this since it was -5 this morning! Wow - so pretty. 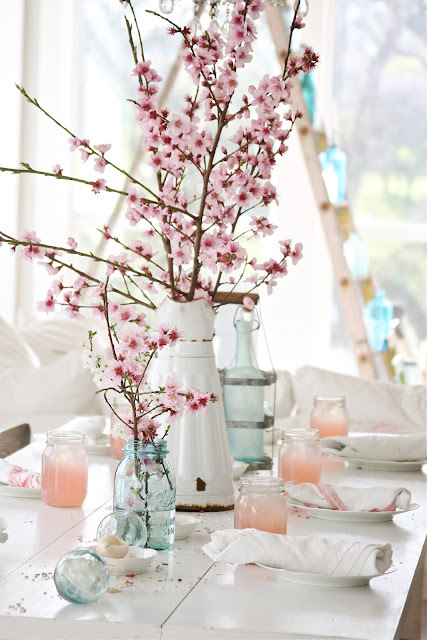 Love the pink with the blues...and the whites. Just as lovely the second time around! I swear I could jump into your photos and live there!!! Always gorgeous!! Are you coming to Illinois in May ?? (crossing my fingers). Great images love the mood/atmosphere in them. I love your sea glass accents, bottles, and floats. I'm on the lookout for some beauty's for my cottage. The flowering branches are a hint of spring to come. I think I hear the Easter Bunny coming! These pictures are beautiful. Love the blossoms! Emma. MERCI pour ce très beau moment de sensibilité et d'espérance grâce à ces fleurs si belles et si fragiles.. Your pictures are so fantastic..words are not enough..Thank you for sharing. Dying over your table. I live at the beach in LA and this table is great inspiration. Are those Cherry Blossoms? I'm so jealous. 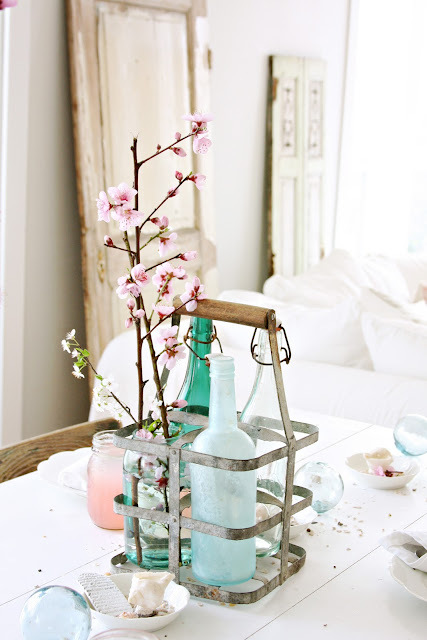 Love the mix of sea glass and the materials. Simply beautiful. oh wow, so beautiful! so in love with the blue cupboard! Honestly, Maria...if I could just jump into my computer screen right now, I would! 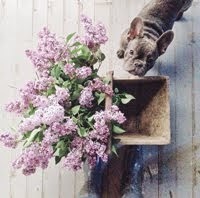 You make this NW gray-day girl happy with your happy, bright home and all that it offers. Your family must LOVE spending time at home. Oh my, this is absolutely stunning! Beautiful photos, inspiring a season waiting to be awaken with such beauty!! You inspired spring in all of us. thanks for the link you little sweetie..
p.s. I sent you a message about your shop...did you got it? Come to my blog...theres a musical giveaway for you! What an absolutely delightful table... the flowering branches are wonderful! Mmmm, I could almost smell the ocean breeze and feel the tickle of sand between my toes. Thank you for the warm thoughts and visual beauty on such a cold winter day! hello dear friend, once spring is here and then we enjoy it very much. I always enjoy your beautiful pictures, you are a very talented photographer. I think I jump into your amazing photo warm hugs to you / Ingela. These pictures made me feel happy inside! 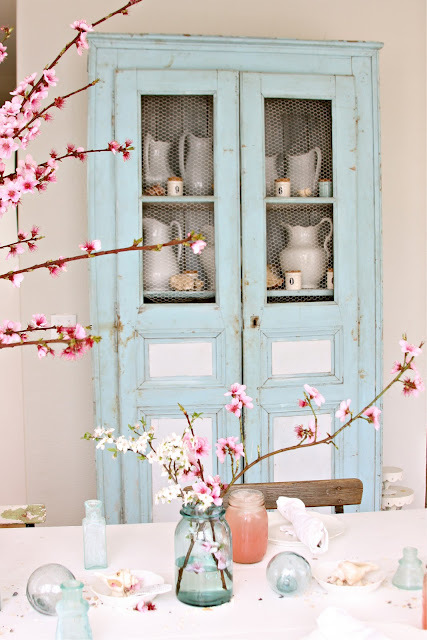 Those blossoming branches are just beautiful...My husband and I painted our laundry room a similar color to your cabinet- the color was called sea turtle- and it reminds me of the ocean every time I go in there. It makes doing laundry a little more enjoyable. Maria - all of us cold winter girls needed to see these photos again. It was sunshine to our souls! :) Thank you for that bit of spring to brighten our day! Just beautiful -- as always! these photos make me so happy, knowing spring is around the corner. i love all the little hints of blue against the white, lovely work! Hey Maria...I'll dream much better thinking of spring after seeing these photos...thank you! you should see how huge I am now! you know what I'm talking about!! Your photos are a breath of fresh air, Maria. They are stunning! Your dining area is fabulous. The soft pink touches and pale blues with all of your clean white is so relaxing and peaceful. This is the most beautiful blog !!! Oh my, I can't seem to leave it. I am your greatest fan!! The ladder you brought in makes me laugh because I saved a ladder very similar, it hasn't entered my house yet but soon it will..... unbeknownst to my husband. Beautiful pictures! 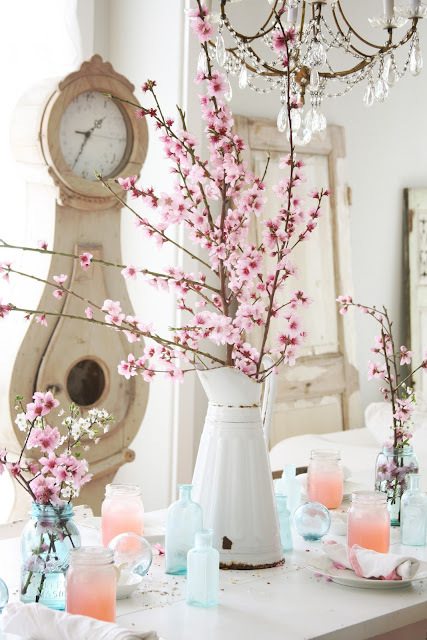 This makes me want to spray everything I own pale blue and white! How many days left until Spring? I can't wait! This is such a beautiful blog! I just became a new follower! I found you through Miss Mustard Seed, and love your style! I am glad to find your blog, is stunning. Added to my list. I am sure that visit you often. I saw your article in artful blogging and had to come and look, wow your blog is fantastic and your pictures are so lovely, I am so envious of your beautiful house and light and everything!! 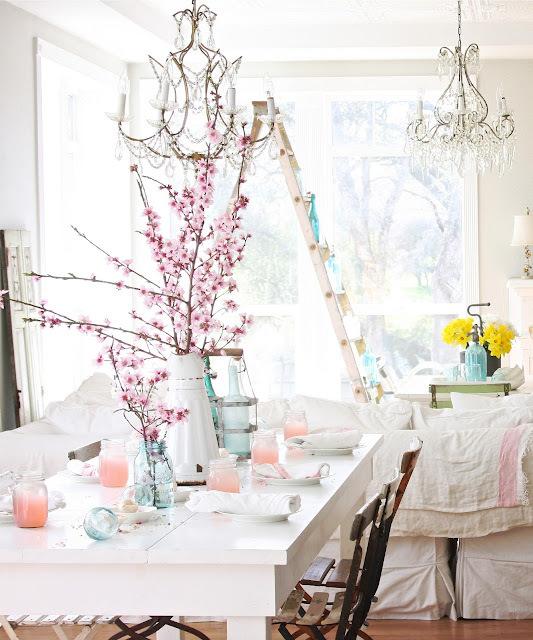 Absolutely stunning styling and photos in this post! Just love them! Where did you get the wonderful dining room table and chairs, or how did you put the set together?? It's stunning! 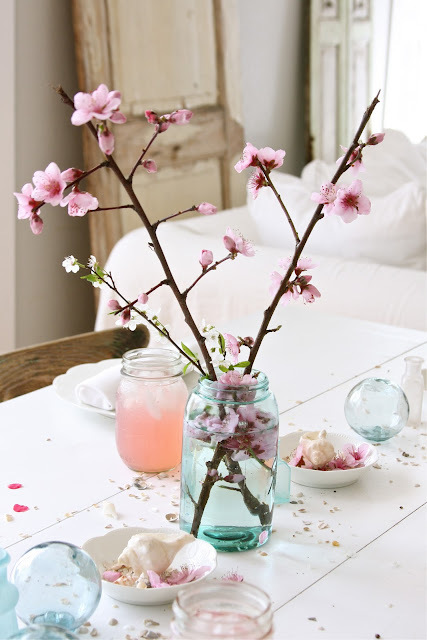 Peach flowers and blue glass are soo cute! anch'io ho fatto un post sull'arrivo della primavera e quando ho trovato la tua immagine su pinterest mi è subito piaciuta!Mi piacciono le tue foto! !